Zoho Analytics is a data analytics software that gives you actionable insights and turns data into intuitive visualizations. 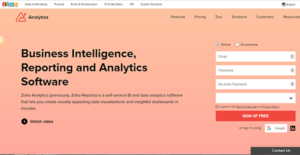 Previously known as Zoho Reports, this tool is upgraded into a robust self-service business intelligence, data analytics, and online reporting platform. It unravels hidden insights, identifies trends, monitors key business metrics, and determines outliers. The tool makes it easy for anyone in your organization to gain powerful reports without an IT’s help. Zoho Analytics gives you a bird’s eye view of your organization’s health and performance across various departments by consolidating data from different sources. Users can then utilize these data to drill down reports through visualizations and building reports and dashboards. Technical skills are not required with the tool’s drag-and-drop editor. Collaboration is achieved with confidence in the platform as it is strongly secure. Reports can easily be shared and published with your team members, clients, and vendors while you can leverage communication with messages and in-context comments. If an anomaly or outlier occurs, everyone is notified in real-time when you set intelligent data alerts. Zoho Analytics also has a smart assistant named Zia. Built over artificial intelligence, natural language processing, and machine learning technologies, Zia can provide you with answers through KPI widgets and reports in response to your questions. Furthermore, the tool enables you to embed analytics based on your own branding. It is accessible on any mobile device – both iOS and Android – and can be integrated with a variety of third-party apps. Aside from its cloud-based solution, Zoho Analytics gives you the option to install the tool on-premise. Using an easy-to-follow wizard, Zoho Analytics lets you analyze data from various sources such as databases, cloud storage services, and offline or online apps. It streamlines syncing and importing data into the system for data merging, formatting, cleaning, splitting, and calculating feeds. The platform’s dashboards give you a quick yet comprehensive glance at your key business metrics such as reports, rich text formats, images and KPI widgets, among others. Creating dashboards is also accomplished with Zoho Analytics’ drag-and-drop functionality. Layouts are highly flexible with rich formatted text for URL links and images. Meanwhile, it also packs attractive themes to choose from or you can opt to build your own. Starting a chart is simple and it can be found right on the platform’s dashboard. It has a drag-and-drop interface that lets you easily create the chart you need by dragging columns and dropping them on the right shelf without any coding needed. You can choose from an extensive list of chart types available such as heat maps, line, bar, pie, geo maps, table, and stacked area, among others. Conducting exploratory analytics and drilling down data can be done with ease as charts can be configured with multiple Y-axis and robust filters. Zoho Analytics empower pivot tables in its feature set as this type of report enables a dynamic and interactive analysis of big data sets. It can be grouped in multiple levels to create more comprehensive summaries and sorted according to columns or required options. Highlighting data cells in the table can be done with conditional formatting to match it with the appropriate conditions. Zoho Analytics is a cloud-based software that can be easily accessed on the web from any browser (Google Chrome, Safari, Firefox, Internet Explorer and Microsoft Edge), desktop (Mac OS, Ubuntu, and Linux OS) or mobile device (iOS and Android). Its mobile apps are built to keep your team, clients, and vendors connected while on the go. It provides a workspace group where you can collaborate and communicate more productively. Sharing and publishing reports and dashboard is also optimized as they can be embedded on blogs, apps, and websites or shared through a generated URL. Furthermore, the tool supports up to 10 languages and continues to work on adding more to its platform. Zoho Analytics lets you install the software for easy business data analysis and dashboards and reports creation with more control. It runs on Windows and Ubuntu operating systems. It is available on free trial for 30 days where you can access the professional features. When the trial is over, you will be downgraded to its Personal edition where you can use the software for free forever with limitations on data volumes. Meanwhile, you can continue with its Professional edition for full collaboration capabilities. If you are considering Zoho Analytics it could also be sensible to examine other subcategories of Best Business Intelligence Software collected in our base of B2B software reviews. There are well-liked and widely used applications in each software category. But are they automatically the best fit for your organization’s special wants? A market-leading software product may have thousands of customers, but does it offer what you need? For this reason, do not blindly spend on popular systems. Read at least a few Zoho Analytics reviews and consider the factors that you desire in the software such as the fees, main features, available integrations etc. Then, select a few systems that fit your requirements. Try out the free trials of these products, read online opinions, get information from the vendor, and do your research systematically. This profound homework is sure to assist you choose the best software platform for your organization’s special requirements. How Much Does Zoho Analytics Cost? We realize that when you make a decision to buy Business Intelligence Software it’s important not only to see how experts evaluate it in their reviews, but also to find out if the real people and companies that buy it are actually satisfied with the product. That’s why we’ve created our behavior-based Customer Satisfaction Algorithm™ that gathers customer reviews, comments and Zoho Analytics reviews across a wide range of social media sites. The data is then presented in an easy to digest form showing how many people had positive and negative experience with Zoho Analytics. With that information at hand you should be equipped to make an informed buying decision that you won’t regret. What are Zoho Analytics pricing details? What integrations are available for Zoho Analytics? Pros: The platform has all the features I personally need, and it offers the most flexible method for customization of reports I've ever seen. It syncs perfectly with Zoho CRM, meaning that you can also email the reports automatically, and you can bring data from other sources as well. Cons: The platform will cause a problem once in five years. That's how good it is! However, we are concerned about something else: currently, the only CRM modules that can sync with Zoho Reports are the default ones. We expect the development team to sync the customizable ones too. Pros: I don't know about other users, but I've never worked with such solid tool without doing some serious cutting of my budget. This is the first time I got something that powerful on such a reasonable price! Zoho Reports enabled me to create detailed custom reports, and all I have to do is to import data from our local database, either manually or with automatic scripts. Cons: It took me a while to get used to its interface. The setup process was somehow more than my intuition can handle, and I stuggled to do script uploading because there was no feedback to inform me on the success of my operation. I compared it to some more expensive tools (Tableau, SAP Lumira), and saw that many essential features are still missing. However, Zoho Reports is a great on-budget solution for less advanced operations. Easy to implement, even easier to report with! If you need more information about Zoho Analytics or you simply have a question let us know what you need and we’ll forward your request directly to the vendor.